God has brought me here to Whaddon Way to serve the local community in all its diversity. 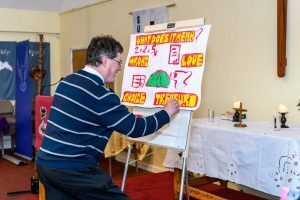 To share and make real the love of God in practical ways; as we explore in community together the relevance of Jesus and his message of hope in our daily lives. Sometimes we can feel isolated. Unemployment, poverty and time pressures can seem overwhelming but faith in God offers a different perspective as we experience God’s presence with us in every aspect of life. I am husband to Alison, and father to two daughters, Beth and Katie, who are both studying at University at different ends of the country! This means that in term time our house is relatively quiet, apart from our dog Scooby. I grew up on the South Coast, and as a result, support Southampton football club! Alison and I met in Coventry, where we were both working at the time, Alison teaching and I at the City Mission. I am excited that God has called us to be part of His Church here in Bletchley.